The boreal summer intraseasonal oscillation (BSISO) has strong convective activity centers in Indian (I), Western North Pacific (WNP), and North American (NA) summer monsoon (SM) regions. The present study attempts to reveal BSISO teleconnection patterns associated with these dominant intraseasonal variability centers. During the active phase of ISM, a zonally elongated band of enhanced convection extends from India via the Bay of Bengal and Philippine Sea to tropical central Pacific with suppressed convection over the eastern Pacific near Mexico. The corresponding extratropical circulation anomalies occur along the waveguides generated by the North African-Asian jet and North Atlantic-North European jet. When the tropical convection strengthens over the WNPSM sector, a distinct great circle-like Rossby wave train emanates from the WNP to the western coast of United States (US) with an eastward shift of enhanced meridional circulation. In the active phase of NASM, large anticyclonic anomalies anchor over the western coast of US and eastern Canada and the global teleconnection pattern is similar to that during a break phase of the ISM. Examination of the evolution of the BSISO teleconnection reveals quasi-stationary patterns with preferred centers of teleconnection located at Europe, Russia, central Asia, East Asia, western US, and eastern US and Canada, respectively. Most centers are embedded in the waveguide along the westerly jet stream, but the centers at Europe and Russia occur to the north of the jet-induced waveguide. Eastward propagation of the ISO teleconnection is evident over the Pacific-North America sector. The rainfall anomalies over the elongated band near the monsoon domain over the Indo-western Pacific sector have an opposite tendency with that over the central and southern China, Mexico and southern US, providing a source of intraseasonal predictability to extratropical regions. The BSISO teleconnection along and to the north of the subtropical jet provides a good indication of the surface sir temperature anomalies in the NH extratropics. 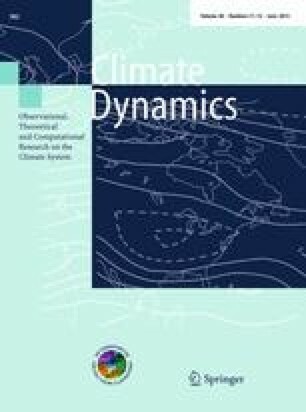 This work was supported by the Climate Dynamics Program of the National Science Foundation under award No AGS-1005599 and by GRL grant of the National Research Foundation (NRF) funded by Korean government (MEST) (No. 2011-0021927). ECMWF ERA-Interim data used in this study have been obtained from the ECMWF data server. This manuscript is SOEST Contribution No. 8677 and IPRC contribution No. 888.